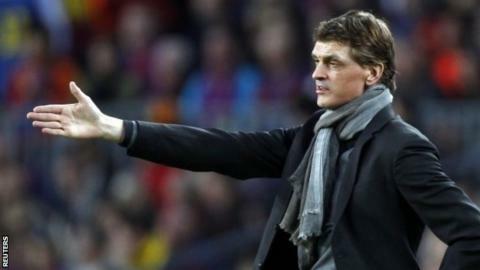 Tito Vilanova's death at the age of 45 was the news that nobody in Spain wanted to hear but everybody silently feared they would. Ever since the former Barcelona manager suffered his second relapse in his battle against throat cancer in July, heartfelt wishes that he would eventually make a full recovery were tinged by the fear that even his stoic determination and the good wishes of millions might not be enough. During the last few months he kept a deliberately low profile, making his final public appearance in January, when he attended Barca's Copa del Rey meeting with Getafe to watch Lionel Messi make his long-awaited comeback from injury. Other than that, he stayed out of the limelight until Friday morning, when local media broke the news that he was fighting for his life after suffering a deterioration in his condition. A matter of hours later, the worst-case scenario came to fruition as Vilanova's passing was confirmed. The current outpouring of grief and unalloyed respect from a wide variety of sources is entirely sincere. Vilanova's honest integrity and humble intelligence ensured he has always been universally admired - even by his club's eternal rivals, Real Madrid, whose captain Iker Casillas was among the first to publicly offer his condolences. Amid the tributes, one thing that should stand out - and should be remembered by football historians for many years to come - is just how influential Vilanova's role was in developing the unique tactical approach that has brought so much success to Barcelona in the past few years and consequently changed the way many people all over the world think about football. His association with Barcelona went back three decades, to the time he joined the club's youth system as a teenager. There, in the famed La Masia academy, he soon developed a lifelong friendship with a fellow emerging pro: Pep Guardiola. The two went different ways as Guardiola enjoyed a stellar career with his boyhood club while Vilanova failed to reach those heights and spent his playing days at a variety of sides including Celta Vigo and Elche. But they always stayed in close touch, and when Guardiola was given the opportunity to take his first managerial role with Barcelona's B team in 2007, his trusted old friend Tito was his natural choice as assistant. It helped that, by then, Vilanova had already gained experience in the club's coaching set-up by taking charge of an Under-14 team containing three extremely promising young players: Lionel Messi, Cesc Fabregas and Gerard Pique. Guardiola and Vilanova enjoyed great success in their first season together, leading the B team to promotion and sufficiently impressing the club's hierarchy to be entrusted with the role of managing the senior team following the departure of Frank Rijkaard. The rest is the stuff of legends, with Barca winning an astonishing 14 trophies out of a possible 19 during a spectacular four-year period that reduced the watching world to awestruck admiration and led many to describe the all-conquering 2011 vintage as the best team ever to have played the game. Throughout that period, Vilanova was much more than an ordinary assistant manager. As Guardiola's most trusted ally, he was a sounding board, confidant and advisor, playing an active role in developing the team's playing strategy. Tiki-taka, as it has become known, was very much a joint creation, readily acknowledged by Guardiola himself, who once said: "I was just the voice of the ideas that Tito and I developed together." When Guardiola resigned in 2012, Vilanova was the automatic choice to take over - not just to provide continuity, but also because he had shown all the traits to suggest he could become a world-class manager in his own right. In his first few months in charge, he quickly proved his credentials by leading his team to an incredible 55 points out of 57 in La Liga - 18 wins and one draw from 19 games. Not only were Barca winning, they were arguably playing even better than they had done under Guardiola. And if a key parameter for a manager is cajoling the best possible performances out of his star players, Vilanova earned top marks in that respect as Messi - the player he had coached as a 14-year-old boy - broke the all-time world record by scoring 91 goals in a calendar year. But in late December 2012, just when it seemed that Vilanova was heading for a long and glorious reign, tragedy struck with the re-emergence of the throat cancer that had seemingly been successfully treated a year earlier. He spent two months in New York recuperating and, tellingly, the team's performance levels dipped during his absence, culminating in a comprehensive Champions League defeat by Bayern Munich. Vilanova had returned to Barcelona by then but his enforced sabbatical had clearly affected the team's progress, and last summer he was approaching the new campaign determined to answer suggestions that the Barca he had helped to create was a declining force. Sadly, he never got the chance to do so; his cancer reappeared in July, forcing him into a regretful resignation and robbing the football world of a man who genuinely could have gone on to become an all-time managerial great. Aside from his innovative, intelligent approach to football coaching, Vilanova was also utterly admirable as a human being. Barcelona's obituary describes him as "brave, honest, hard-working, perfectionist, methodical, pragmatic and intuitive", and anyone who had spent time in the same room as him would readily agree with those adjectives. Vilanova leaves a wife and two children, including a 17-year-old son, Adria, who is a central defender for Barca's youth team and whose progress is understandably being followed with particular interest and encouragement by the club's fans. Irrespective of whether Vilanova junior eventually lines up for the first team, however, Francesc 'Tito' Vilanova's legacy is already assured. As one of the key innovative creators of an epoch-defining team, he will be remembered as a great football man; he will also be remembered as simply a great man.